DC EcoWomen celebrates Earth Day annually – you might even argue that we honor it every day through the work our members do. One of the ways we showcase the incredible environmental efforts of our members is through our annual photo contest. We recently sat down with the 2017 People’s Choice photo contest winner, Maggie Dewane, to revisit the photo she submitted from her travels to Antarctica – “In the Midst of Climate Change” – and ask what Earth Day means to her. DC EcoWomen: Why did you submit a photo for the Photo Contest? Maggie Dewane: DC EcoWomen provides this really wonderful and warm platform for women in environmental fields to connect and support one another. Following my expedition to Antarctica, I felt proud to have taken an opportunity to broaden my professional development and environmental awareness. Sharing my favorite photo from the expedition with such a supportive network seemed like a great idea! And now, one year later, that photo and the photo contest have connected me with new friends and professionals. I have DC EcoWomen to thank for that. DCEW: Why were you in Antarctica? MD: I traveled to Antarctica because as an environmentalist and writer, I often try to communicate the story of climate change to a wide range of audiences. By seeing climate change firsthand and learning from scientists who study there, I gained a new and unique perspective into that story. Following my expedition, I made a short video [below] to educate audiences and encourage them to learn more so that they may feel empowered to fight climate change. DCEW: What were you thinking about while you were there, especially as you were taking this photo? MD: When this photo was taken, I had just seen three Adelie penguins – a penguin species that serves as an indicator of climate change. We were on Petermann Island, historically a nesting ground for Adelies. These penguins thrive in the most frigid and freezing temperatures of Antarctica, but as summers are getting warmer and winters are getting shorter, they are having to move further south down the continent. So this moment was novel and exciting. Additionally, the majestic backdrops were breathtaking and humbling. How outstanding to be in one of the last untouched wild places, in its raw beauty. However, the bright and beaming sun and those penguins served as a reminder of the reach of anthropogenic climate change, even this far removed from civilization. DCEW: What does Earth Day mean to you? DCEW: What would you tell women who are considering submitting a photo for this year’s contest? MD: Do it! Be proud of your accomplishments because we’re all rooting for you. Now it’s your turn! The DC EcoWomen photo contest will launches on Earth Day (Sunday, April 22) and submissions will be accepted through May 23 at midnight. Photos should feature environmental issues, career growth opportunities, D.C., or all of the above. Details and contest rules can be found on the Photo Contest page. We hope you participate, and good luck! Maggie Dewane is the US Communications Manager at the Marine Stewardship Council and a DC EcoWomen Member. Have you been reading DC Ecowomen’s blog since its inception? We have, and there’s some great stuff in the archives. Like this post, for example. Read on below for a #throwback to one of the blog’s first career tips. Check out our EcoArchive (righthand side of the page; scroll down) for the full history of posts. It’s time for your elevator pitch! First of all – know your audience. Who are you talking to and what is most interesting to them? Secondly, know yourself and what you can bring to the table. Your pitch may vary if you’re looking for a job or telling people about your organization, but these basics will apply. 1. Who are you? Make sure to clearly state your name and mention what sets you apart. 2. What are you looking for and why? Have a good idea of what you’re looking for whether it is an internship, job, or fellowship. The more specific the better. 3. Do you have a specific outcome? If it’s appropriate, asking for a specific outcome can be helpful such as an informational interview or advice on your search. The more open-ended the request, the easier it will be to continue the conversation. Whether you’re prepping an elevator speech for your organization or in your job search, it can help to craft a “story” to tie these elements together. Remember to know your audience (and what matters most to them) and know what you can bring to the table! Winners of the Annual DC EcoWomen Photo Contest! posted by Cassidy Pillow | Comments Off on Winners of the Annual DC EcoWomen Photo Contest! Among many stunning entries, the winners of DC EcoWomen’s Annual Photo Contest have been selected. The Second Annual Photo Contest brought in countless stunning photos for three categories: Sustainable Living; Women in the Workplace; and Natural Urbanity. The winners have been awarded environmental-themed prizes, including gift cards to local businesses. Check out the winning photos below! A big thank you to all of the wonderful EcoWomen that submitted entries. Did you miss out on the contest this year? Have no fear! The Photo Contest will come around again next summer. Keep those cameras handy, because it’s never too early to capture a beautiful moment on film. Over just a few years, the way people find and consume news has changed dramatically, and so have the environmental problems that the news covers. At the May Ecohour, seasoned journalist and Deputy Editor of ClimateWire Lisa Friedman detailed her experience in the world of environmental journalism, and shared her thoughts on making environmental news relatable. Early in the evening, Lisa surprised the crowd at Teaism with the details of the unusual path she took to her position at a climate-focused policy publication. While she currently covers the business and politics of climate change for ClimateWire, she spent years on the prison and crime beat in California and Nevada. Even her first move to Washington, DC was to be the Washington bureau chief for the Oakland Tribune, not to cover environmental issues. But in making the transition from reporting on crime and politics to writing stories about international climate negotiations, Lisa made the discovery that her new beat was not so distant from her previous ones. “Sometimes I don’t feel like I am writing about climate change at all,” Lisa explained, pointing out that climate news lays at the intersection of many different policy areas, from immigration law to trade. The trouble with environmental beats, she noted, was not that they weren’t relevant, but rather that they had always had a difficult time being valued. What remains most meaningful for Lisa in her reporting, and what she feels turns climate change into a story people connect with, is the ability to go to places and talk to people about their problems. Lisa has interviewed a community downhill from a melting glacier in Nepal and met families trying to pick up their lives after floods in Bangladesh. By being able to report on conditions in the communities most vulnerable to the impacts climate change, Lisa finds she is able to make a compelling story without a PowerPoint presentation or science lecture. 1. If you are respectful, people are responsive. 2. People want to tell their stories. Don’t be afraid, just ask! To read some of Lisa Friedman’s work on climate change, check out her articles in The New York Times and Scientific American and follow her on Twitter at @LFFriedman. “We have a wonderful problem!”, Sue Kirk, executive director of Bethesda Cares explained to me as we chatted between sessions of the TEDxManhattan 2012 viewing party. It was just ten months ago, that the idea for Farm to Freezer—a partnership between Bethesda Cares and Full Plate Ventures was born. Now Farm to Freezer is a speaker finalist in the TEDxManhattan Challenge! If selected, I will speak about Farm to Freezer in New York at TEDxManhattan 2013: “Changing the Way We Eat” a live webcast that will be broadcast to viewing parties world-wide. The winner will be selected by public vote and a panel of judges. Voting is a simple click—no need to register or provide any information; one vote per computer devise. Please share this story and voting opportunity with your friends and colleagues. Voting closes December 15th, so vote today! Bethesda Green and Full Plate Ventures will host a FREE TEDxManhattan 2013 local viewing party in Bethesda. Stay tuned on this site for details and how to register to attend the day-long event on February 16, 2013. The wonderful problem that Sue described to me that cold January morning was that Bethesda Cares, a non-profit organization providing social services to homeless in our community, received more fresh produce as the official gleener of a local farmer’s market, than they could use before it spoiled. Bethesda Cares, whose mission is to move homeless into permanent housing, serves 20,000 meals per year to the homeless population in the Washington DC metro area through a dedicated and caring network of faith-based and community organizations, businesses, and government agencies. In June 2012, Bethesda Cares and Full Plate Ventures launched Farm to Freezer with the generous donation of vegetables from Spiral Path Organic Farm and support from a rich community network of volunteers, churches’ donated kitchen space, and business support. Bethesda Cares’ will use the frozen food in preparing healthier meals for its clients all year long. In our first 20 weeks, we’ve partnered with 180 volunteers, our county’s pre-release program of residents, a culinary arts training program, and received in-kind donations from local businesses. In our first growing season we gleaned 5,000 lbs. of fresh, organic vegetables. We turned these into 1,500 lbs. of tomato sauce and blanched, roasted and vacuum-sealed packets frozen and ready to incorporate into healthier meals that will serve 2,500 homeless throughout the year. Our goal is to scale up Farm to Freezer. There is huge potential to glean from other farmers, provide to other feeding programs, and create a job training program. Through the sale of some of the organic tomato sauce and veggies, Farm to Freezer can become a self-supporting social enterprise. 5) Raises community awareness about homelessness, nutrition, and locally-grown food. Winning a speaking opportunity at TEDX will provide critical visibility and, hopefully, lead to funding that will support this social enterprise. Vote today! www.tedxmanhattan.org/challenge . 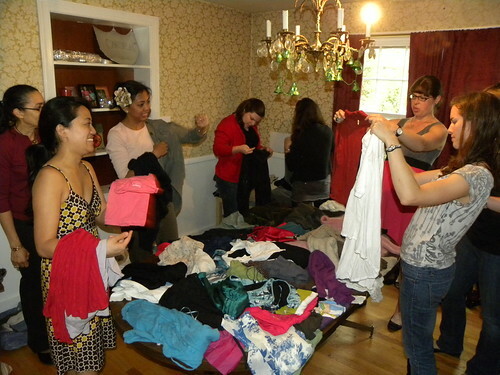 Saturday’s rain couldn’t keep nearly 30 EcoWomen away from a good spring clothing swap! Ladies filtered into the party between 11am and 1:30pm with fresh waves of shirts, skirts, sweaters, and shoes. Goodies from PJ’s to professional garb with jewelry and accessories to boot filled the tables, couch, and floors of hostess Stephanie’s house in Wheaton, Maryland. At first, the dining and living rooms started out with labeled stacks of neatly folded clothes. Eventually, a good spirited chaos settled over the rooms as we dug through to find the perfect top or skirt and more ladies came in with more clothes to contribute. 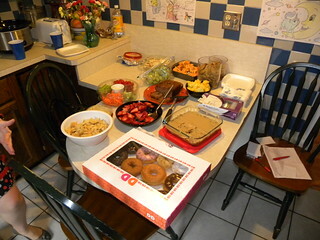 We’d retreat from time to time into the kitchen for a mimosa and some snacks to chat and refuel before diving back in for another round. I was happy to see some new faces and to catch up with those of you who have made it out to one or many of our events previously. 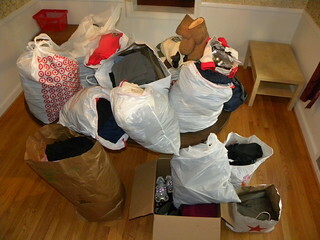 Thank you to all who trekked over and created a successful swap! What is this energy efficiency and green building thing about? posted by dc ecowomen | Comments Off on What is this energy efficiency and green building thing about? According to a study by McGraw-Hill Construction, in 2011, green buildings in residential areas made up 17% of new construction, totaling $17 billion in economic growth. This survey also concluded that the value of the green building market is expected to grow up to 38% of the market by 2016, with new construction projects making $87–114 billion of economic growth in the construction industry. Not only are green homes swiftly becoming the leading project in new construction, but 46% of homebuilders say that green design services makes it easier to receive new contracts, and 71% of contractors that exclusively build green homes claim that offering green services gives them a lead in the construction market. Working towards the goal of reducing our buildings environmental footprint is becoming easier each year. McGraw Hill reports that the cost to build or retrofit a green home is now 7% less than what it was in 2008 and 11% less than in 2006. The study also showed that by 2016, 90% of homes will have green technology incorporated into the construction process. Indeed, the shift towards green homes is already in progress. In 2011, green retrofits of buildings surpassed new construction projects, and over 1/3 of the construction and building industry (661,000 people) say that they have a “green” job. By promoting sustainable architecture and retrofitting current homes to make them high performance green buildings, we reduce our overall carbon footprint and improve our quality of life in an economical and environmentally friendly way. Did you know that the Empire State Building is actually a green building and that a local woman played a key role in getting the well-known NYC landmark LEED – certified? Katrina Managan, a program manager with the Institute for Building Efficiency at Johnson Controls shared her career experiences in green building along with those of two other amazing female building sustainability experts at February’s Eco Hour. Co-panelists, Seema Wadwha, a LEED AP and the director of sustainability at Urban Ltd., and Kristin Anderson Arnoldi, a project manager at DC’s Greenshape LLC, discussed the victories and challenges of their work with to a packed house on Tuesday, February 21. Managan, who spent five years doing climate change legislation for the National Wildlife Fund transitioned to a green building role because she ‘wanted to get closer to the ground’ on sustainability issues. The Empire State Building project has a three-year payback, Managan said, adding that her recent survey of 4,000 facility managers indicated that lack of capital and financing are the chief obstacles to U.S. companies investing in making U.S. buildings more energy efficient. Seema Wadwha found herself in a cutting edge role when she agreed to lead INOVA Health Systems sustainability projects. “We had to define what sustainability looks like in the health care industry,” she said. “Green buildings are a strong physical representation of what your organization believes in. For Inova it became clear that building healthier buildings that use fewer carcinogens and are more efficient to operate is close to their mission of being health care leaders.” She was delighted to see a surprise manifestation of INOVA’s stated goals of driving employee engagement and community engagement through a healthier, greener building. During the project some of the hospital’s engineers made a secret garden on the roof using recyclable materials. “It was proof that they were realizing the value of green buildings”. Kristin Anderson Arnoldi’s work involved overhauling an ancient DC landmark to LEED-Gold standards. “The Department of the Treasury was built between 1839 and 1869, so you can imagine how inefficient it was,” she said. She takes pride in the fact that the project is estimated to save U.S. taxpayers $3.5 million dollars annually. That project also had an interesting surprise. “We discovered that the White House was actually stealing their water for irrigation from the Treasury building and no one knew about it,” Arnoldi recalled. Marin Rose, from Functional & Fashionable, joined DC Eco-Women February 1 for a presentation on how to get organized in a green and eco-friendly way. Marin opened up the event to a large crowd with a few inspiring remarks, “Don’t own anything you don’t love, that you don’t need… or both.” Marin stressed that streamlining your life can be an eco-friendly process, and when you are organized, your life is ascetically, spatially, and emotionally streamlined—without the need for clutter. Marin reminded us that useless clutter is emotionally draining, and gives us a false sense of security. 1. Know what you have and what you need. By knowing exactly how many wearable dress shirts you own, or how many boxes of cereal your household consumes in a timeframe, you stop overbuying items that you already have. Marin asked how us, “How many times have you bought an item at a sale, and then discovered at home that you already own a similar item?” When you know what’s already in your closet, in your pantry, or in storage, you don’t run the risk of wasting money and time purchasing items that you already own. Marin said that this also applies to perishable goods; when you figure out how many heads of lettuce you can consume in a week, you stop over purchasing groceries and no longer throw perfectly good food (and money) out in the garbage. Once you figure out how many dress shirts you have in your closet, how do you figure out how many shirts you’ll need? Marin suggests that you look at how many times you wear or use that item in a week, multiply by 4 to get the number you would wear in a month, and then adjust up or down based on the instance. For example, I usually wear a button up dress shirt to work every day. I would multiple my 5 shirts a week by 4 weeks to give me the 20 dress shirts that I would wear in a month. I would then subtract 3 shirts or so, because I can wash and rewear a white dress shirt numerous times a month. If I have 30 dress shirts in my closet, I now know that I can donate 10 – 12 of my older or outdated shirts without needing to purchase any more shirts. 2. Donate items frequently! Once you know exactly what you have in your house, you will find that you have a pile of items that you no longer need. There are many organizations that will gladly accept your out-of-fashion pantsuit or your ancient pair of tennis shoes mildewing in the closet. By donating items that you no longer use, you remove clutter from your home and give that item a new life with a deserving recipient. Marin suggested Soles for Souls, Goodwill, Martha’s Table, Books for America, or Dress for Success as a few organizations that will happily accept your donated clothes, household goods, and food. You can even write many donations off on your taxes. 3. Keep a Calendar. Want to write a book? Run a marathon? Repaint your living room? Schedule it on your calendar! It’s easy to commit to a goal, no matter how large or small, if you schedule it on your calendar. The trick is to keep your appointment with yourself. Marin says, “If you respect other people enough to keep appointments with them, respect yourself and keep your own appointments with yourself!” You’ll find that the goal of organizing your bedroom closet “one day” will happen as if by magic when you write in 1 hour a day of cleaning and organizing into your daily planner. 4. Do the Work Before You Purchase the Solution. Many times you find that you already own the perfect container for your out-of-season clothes, you just need to organize the clothes. By committing to doing the work first, you will easily find a solution at hand for many of the problems you face. Marin suggested re-purposing old shoe boxes to use as storage spaces for scarves and hats, used gift bags for your make-up, and using luggage to store out-of-season clothes. Marin concluded the event by introducing Andrea from Repax.com, an eco-friendly moving company that eliminates the cardboard box. Repax offers predetermined room bundles of shipping containers and eco-friendly packaging supplies. They offer services in the DC metropolitan area, as well as Los Angeles and New York City. Marin offers her services for organizing or redecorating your home or office, staging your home for a sale, or helping you pack for a move. She often partners with Repax.com when she helps a client move. Suzanne Ehlers speaking with a DC EcoWomen member. The impact of climate change on the developing world is great and it disproportionately affects women. That’s the message Suzanne Ehlers, President and CEO of Population Action International brought to DC Eco Women’s January Eco-Hour. ‘Two-thirds of all market goods in the world are physically carried there by women. Ninety percent of the world’s rice is grown by women. If a woman has to go farther for water due to climate change she is going to encounter more danger. Women in the developing world don’t have time to go to a family planning clinic one day and a climate change meeting the next. They are extremely busy making ends meet’ Ehlers said. Her organization connects women’s reproductive choices to environmental sustainability. Ehlers realizes that parts of her mission can be interpreted as controversial. ‘The language around what we do is important because of the abortion debate and we pay close attention to it. Sometimes a conversation about women’s reproductive choices is not an easy one to have but it’s impossible not to discuss it’, she said. Population Action International is about a whole range of reproductive choices, according Ehlers. ‘Our model is totally demand driven. There are 215 million women in developing countries who wish they had a pill or an IUD to space their children’s births. I’ve met 19 year-old women on their fourth pregnancy. Some people wonder why these women are not working or contributing more to their communities. It’s because they can’t find a pill pack to save their lives.’ She shared her organization’s belief that increasing voluntary action to contraception saves women’s lives and gives them an opportunity to improve the futures of their families. Ehlers is a busy mother in addition to her executive position. She recounted being hired at PAI while pregnant. Proof, she notes ‘that you can still grow a family and have serious professional ambition. ‘Her dedication to life of pursuing women’s justice came through a series of ‘defining moments’. On her first paid job at a landscaping company in her native Texas, she operated a forklift and male customers drove away rather than allow her to load their trucks. Later in her youth, she played the part of Jesus in a religious passion play which sent some male members of the congregation out of the church. ‘Keep an open channel, she said. The idea that you can always connect the dots in your career is b.s. Take a chance, try something new. Temp work is not a dead end. I got my job at the Wallace Foundation through a temp agency. I started as a very proud executive assistant.’ The temp job led her to become an Associate Program Officer at the Wallace Global Fund where she broke new ground in the fields of sustainable forestry and the reform of international financial institutions. The position also allowed her to shape the early foundation for philanthropic engagement on climate change. She recommends a book about women’s leadership: How Remarkable Women Lead: The Breakthrough Model for Work and Life by Joanna Barsh, Susie Cranston and Geoffrey Lewis.